Written by Pastor Joshua Scheer, originally published at Brothers of John the Steadfast on Dec. 4, 2013. It seems like pastors are always looking for some ways in which to catechize their members of all ages (new or veteran ones) in the truths of the Scriptures and the Catechism. This is what most catechetical materials are built around, but it often misses a third key to the Christian life, how our beliefs from Scripture and Catechism find their expression in our daily lives or in our worship (best found in the hymnal). It can be said that the three most essential works for a Lutheran to have would be the Bible, the Small Catechism, and the Hymnal. Catechesis should help reinforce that. Didache is a resource which seeks to do just that. I have used it in catechesis in the past and it was a wonderful way to teach the faith and our expression of it in worship to new members coming out of a non-liturgical, non-sacramental background (heads up for all of those former evangelicals that have fallen off of the emotional roller coaster of evangelicalism). Connecting the Scriptures to the Catechism to the Hymnal is a great thing to do for our people. 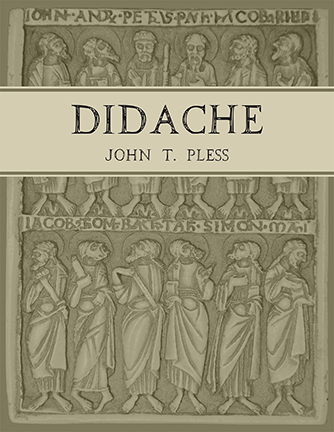 Formerly Didache could be obtained from University Lutheran Chapel of Minneapolis, MN where Professor Pless served as a pastor. Now courtesy of Emmanuel Press it has been revamped and updated to fit with Lutheran Service Book and also expanded from its already excellent previous state…. I would recommend this for pastors looking to catechize new members and help current members connect the dots between Bible to Catechism to Hymnal. I would also recommend this for any Lutheran looking to have those dots connected for themselves. *Visit the Didache page for more information, including a sample of the content and the Table of Contents. This entry was posted in Latest News and tagged Didache, Pless, Reviews. Bookmark the permalink.